Ever wondered what it is like to soar like bird? Ever wondered what keeps them in the air? Well now is your opportunity to soar above the Kildare countryside in a Glider. Gliding is one of the purest forms of flight allowing you fly quietly, and gracefully using the energy around you. Founded in 1952, the Dublin Gliding Club operates from Gowran Grange just outside Naas in Co. Kildare. With a fleet of both two seat training gliders, and single seat solo gliders, the club members have achieved some notable flights. 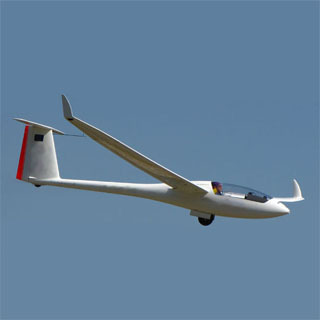 Gliders in Ireland have achieved flights in excess of 5 hours and covered distances of over 200km, with altitudes of over 20,000ft. With these kind of achievements, it is not surprising that this is one of the greatest flying experiences you can have. We fly at weekends all year round and on Wednesday evenings during the Summer months (weather and daylight permitting). Flying only at weekends, you must contact Dublin Gliding School to confirm date and time for outing before placing your order. The club is based at Gowran Grange airfield near Punchestown racecourse, just 4 km from Naas. There are frequent bus services from Dublin's Busaras bus station to Naas town centre (see timetable). The journey time is approximately one hour. A taxi may be picked up from the town centre rank or from any of the taxi companies along the street. Dublin" for details. You will need to ring for a local taxi on arrival in order to get to the airfield. Take the N7 (Naas Road) to Naas. Enter and proceed straight through the town. Towards the end of the town turn left onto the R411, signposted Punchestown/Ballymore Eustace. (There is a EuroSpar shop on the left hand side just before this junction). Proceed about 3km from Naas along this road to Punchestown cross. Continue straight through the cross roads. After 1km take the next left turn. The club entrance is approximately 100m on the left. How it Works: Use this gift voucher on AllGifts.ie to make a booking with Dublin Gliding Club. Or you can swap this voucher for any other gift or voucher listed on AllGifts.ie. Simply follow the instructions at the bottom of your voucher.